I love being close enough to walk to farmer’s market. When the weather is nice it makes for a good Sunday morning event. One house along the way has a wonderful flower garden in the front yard. I stopped to take a few shots, and let my girls try their hand at some as well. This entry was posted on May 3, 2010 by Sean Kane. It was filed under Flowers & Plants, Photos, Uncategorized and was tagged with alyssum flowers, DOF, farmers market, flowers, Photography, purple, white. Maybe it’s just my monitor, but this one looked a tad bit dark to me. Perhaps you intended it that way. Good focal point though with the one clump in focus. I like it! I don’t think it’s too dark at all, because the darkest areas are the ones that are most out of focus, so the darkness isn’t distracting (to me anyway). 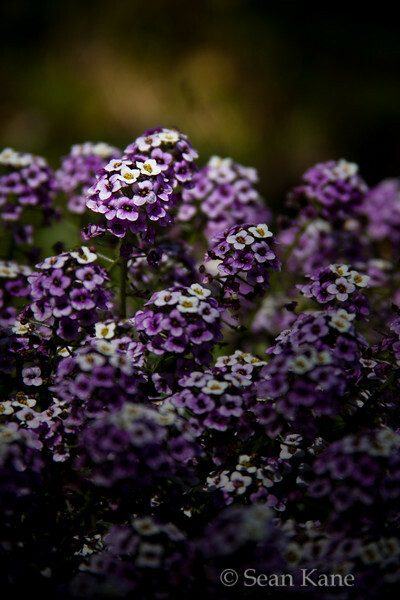 The purple alyssum is really pretty, I’ve only seen it in white. Sweet! We have a similar eye! 😀 Thanks! Nice capture of these little gems. They smell so good I’m always a bit distracted when photographing them. Dark is my preference so I see this photograph as perfect! Jewel, I never noticed a smell from them. I may have to pay more attention next time. Of course it could be because some of the nearby flowers were overwhelming. 🙂 Thanks! You know a tighter crop might work better, but this work’s great. I like the processing that was done, the shallow DoF is nice. BTW what camera do you work with? You may be right on the need for cropping. I have a few times, held my fingers up to screen to frame a crop. I haven’t yet tried it in Lightroom. Maybe I should. As for my camera, I’m using a Canon 50D.